We offer two groundbreaking workshops for parents, teachers and support people of those with ASD. For parents, teachers, teacher-aides and support people of autistic individuals under 8 years of age and/or autistic individuals with low/no verbal ability. Is your child or someone you are working with struggling to pick up those initial early life and social concepts? Are the concepts of change and consequence not sinking in? Do they find it difficult to maintain focus? Is transferring their knowledge into real world situations a challenge? The ground-breaking Davis® Stepping Stones workshop could be just what you need. 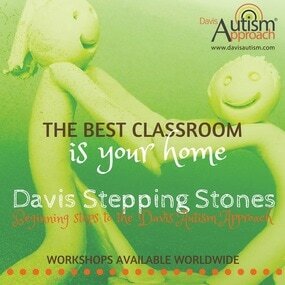 Davis Stepping Stones is a holistic programme, developed to assist you in helping your child/student who are on the autistic spectrum and /or are struggling to meet early childhood development milestones. The Davis Stepping Stones workshop teaches you how to help your child reduce meltdowns, meet childhood milestones, and make sense of the world. - all without losing their beautiful uniqueness. Developing a knowledge base of how to integrate these concepts into the child’s daily life. struggle with making sense of the world? find time, understanding time, or being on time challenging? find it difficult to create order in different aspects of life? have real difficulty in taking responsibility? A set of simple, effective self-management strategies, that enable you to manage stress, control energy levels, and maintain focus. How to achieve Individuation – helping your loved one to develop accurate perception and an awareness of self. Gaining practical experience in using clay to explicitly teach the Davis Life Concepts for Autism. These include: consequence, time, sequence, order and disorder - facilitating true understanding of one's environment. Other concepts covered include: emotion, want, need, motivation, and responsibility. There is also a set of Relationship Concepts which include exploring relationships based on trust, belief, agreement and rules; as well as the idea of making decisions based on what is good, bad, right and wrong. Developing a knowledge base of how to integrate these concepts into your loved one’s daily life. 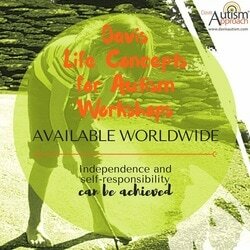 Although based in New Zealand, licensed Davis Autism Presenter, Melanie Curry, is able to provide workshops worldwide. Would you like to find out more about our Davis Autism workshops? Workshop descriptions and images are adapted from material belonging to Davis Autism International. ​"This workshop was informative, inspiring, and some of the best professional development we have experienced around the areas of Autism, ASD and Aspergers. As adult learners we felt valued and inspired to move forward with your programme."